Do I brand a student as “can’t do maths” or can I teach her differently? When I was asked to write about the changing role of the teacher, I decided to write about my role model – my mother, a teacher, and hope that many more teachers will be like her and not like my class four mathematics teacher, Mrs. Raj. 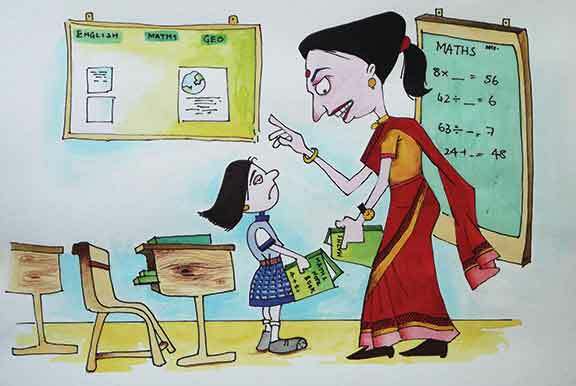 Mrs. Raj was very strict and believed in the power of the ruler, not just to draw straight lines but to rap knuckles! My pronounced knuckles today are the result of many such rappings. Long division flummoxed me and I was lost in maths class! Her succinct description of me was: “Geetha is a very good student, but she can’t do maths!” End result: I dreaded going to school, tried excuses like stomach aches and headaches (which hardly worked); rarely did my maths homework, and so got punished or beaten or put into detention! And then, revelation dawned! One day, midway through the school year, Mrs. Raj asked one of my classmates where her homework was: her reply: “Oh, miss, I started a new notebook today; it is in my old book; I left the old one at home by mistake.” Mrs. Raj accepted the excuse and simply told her to bring it the next day. You can guess what happened! The notebook got thinner, and of course, Mrs. Raj got suspicious! How often does one need new notebooks? She soon cottoned on, but was totally at a loss on how to deal with such ‘ingenuity’. I was therefore marched off to the Principal’s office. The principal was equally at a loss, scolded me, and then, asked Mrs. Raj to bring the notebook of a ‘good’ student; I got a new notebook from the school book shop and was asked to copy out all the pages I had torn. She also told me that I would be allowed to go home only when I had finished. Since I did not get home in time, my elder sister was sent to school to find out the problem. She must have assured the principal that she would get me to do the work at home, for I remember being sent home soon. I must have been scolded by my mother for all this, but interestingly, that is not what I remember at all; it could not, therefore have been a ‘bad’ scolding’ and definitely not anything close to being hit with a ruler! My mother had been a maths teacher in a school for more than 10 years before she got married. With that knowledge and experience, she ‘diagnosed’ my problem and found a solution! How did she do this? I don’t remember her diagnosis, but she must have given me some sums to do. She discovered that I had not understood that the basis of long division is long multiplication. During the holidays, therefore, she took it upon herself to teach me long division. Even today, I can recall the steps she taught me. Her system was simple. I was asked, before I started doing the long division sum to create my own multiplication table of the divisor. I had to write 1-10 in a row, and if I was dividing by 234, had to work out first multiples of 234. After that, she made me do long division sums until I had them coming out of my ears! School began, and presto, I began answering all the sums in class; my hand would go up in a jiffy and my answers would always be correct! Poor Mrs. Raj could not believe what was happening! She was convinced that I was copying from my classmates! So, she made me sit in a different place every day; but I still got the answer right! In the end, frustrated, she made me stand in front of her desk and work out the ‘sum’. To this day, I will never forget her words: “Your answer is correct, but your steps are different.” Till then, it had never occurred to me to tell her that my mother had taught me. When I did, she had nothing to say, at least not something I remember. After that day, any doubt I had in mathematics, I went straight to my mother who would explain it to me. Outcome: The girl who supposedly couldn’t do maths got a centum in her first public examination. Teachers today need to be like my mother and not like Mrs. Raj! One teacher saw a problem in a child and labelled her as not capable! Another decided that stupid children don’t exist and probed deeper to find out what was wrong. Failure is not the absence of success but just a First Attempt In Learning. There are no wrong answers, only wrong questions. Every ‘wrong answer’ is actually the right answer to a different question. Today, as teachers, we are so caught up in finishing syllabuses and portions in schools that we have stopped being caregivers with our students. My mother had faith in me and my ability to think and work: as such, she was able to locate the problem. If our students make mistakes, or don’t get something ‘correct’ we too need to look beyond the problem and find solutions that will help children learn. This article, by Geetha Durairajan, was published in the July 2014 issue of Teacher Plus.